One of the biggest perceived benefits of genetically modified (GM) crops and foods is the ability of these foodstuffs to be more resilient than conventional, non-GM crops. These benefits not only help the farmers who grow the crops but they also benefit the consumer as well. However, there are still some concerns and issues relating to the use of GM crops and there are challenges that stem from this increased resistance to surrounding conditions. 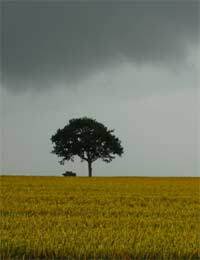 As any farmer will know, crops can be at the mercy of the weather conditions. Long periods without rain, storms and varying seasons all affect the quality and condition of the crops. Poor quality and poor yields not only mean poor profits for a farmer, but it means less available food for the local population. In addition, export crops can affect the entire economy of a nation, which is more devastating in developing countries who place a greater reliance on a small number of crops. The use and production of GM crops, however, can mean that a food is engineered to be resistant to many weather conditions. A crop may be able to last longer under low-water conditions or it may be more resistant to ice and cold temperatures. Also, a crop can be engineered to produce higher yields, which can be particularly beneficial for areas where food is typically scarce and poverty abounds. Another benefit of GM technology is that a crop can literally have a 'built-in' herbicide or pesticide. Rather than spray crops to prevent infestation by pests, the crop can be engineered to resist pests. Other benefits of GM foods include ones relating to animals. Increased animal resistance as well as improved productivity and feed efficiency can all be accomplished by GM techniques. An increased yield of eggs or milk is another advantage of GM foods over conventional ones. Animals can even have greater resistance to disease. Other benefits include the ability of a food to withstand any other environmental factors that can affect its taste and nutritional quality. The crop can also be engineered to have a reduced maturation time, which means that from seed to market is a faster process. Despite a number of important benefits in making crops more resistant through GM techniques, there are still some problematic areas in this technology and production. Study results released earlier this year found that some pests are becoming resistant to GM crops. One particular insect that should have been eradicated by a specific genetically modified crop has now gained resistance to the crop. The cotton crop had a built-in gene that provided resistance to the insect. To create the GM cotton, a gene was inserted into the crop that is usually found in a specific bacterium. The gene then results in the production of a protein toxin that is toxic to some insects but harmless to other organisms. Worse still, this resistance has begun to spread around the United States. Thus far, this incident is believed to be the first example that has been studied and documented in terms of insect resistance to this kind of GM crop. The pest itself is called the bollworm moth and it is extremely damaging to cotton crops. Unfortunately, the resistant type has been found in numerous fields in the southern parts of the United States over a three-year period. Essentially, this result shows that insects and other pests can evolve over time to withstand GM crops. As more GM crops continue to be developed, the issue could eventually become a far more common and significant one. These results indicate that the very purpose of GM crops can be threatened, which suggests that GM crops may need to be regulated and monitored somewhat to prevent pest resistance and ensure that the crops continue to function as they were intended. The benefits of increased resistance due to GM crops can be enormous but clearly, it is a delicate balance to prevent unintended results such as resistant pests.